This copper bracelet is overlayed with nickle and has a indian design with a stamped border. This bracelet measures 1/2" wide. 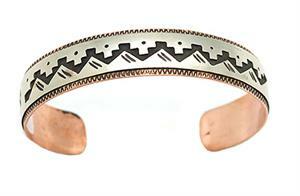 Native handmade by Navajo artist Thomas Begay. Stamping and designs will vary. Currenlty available in road runner, kokopelli, turtle, bear or native wave design. Choose design when ordering.